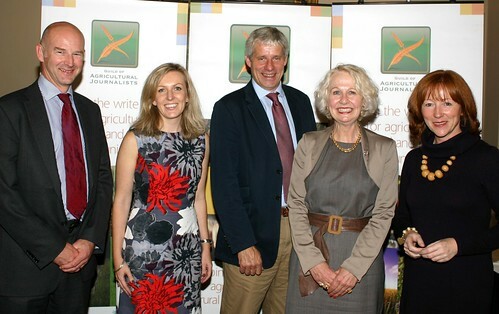 Farmers Weekly has scooped two of three prizes at the annual Guild of Agricultural Journalists of Great Britain Awards. Freelance Nancy Nicolson won in the environment category for her Farmers Weekly article about the effect of poor yields from farming in the Scottish hills. ‘It’s a story of interest to all concerned for the future of Britain’s marginal land,’judges added. Farmers Weekly’s second award was collected by Philip Clarke who won in the livestock category for an article exploring the effectiveness of National Farmers Union proposals to secure the future of Britain’s dairy industry. The arable category award was won by freelance Robert Harris for an article in Crops magazine explaining the political and technical issues relating to tests for mycotoxins in grain. Picture: Philip Clarke (far left); Robert Harris (centre) and Nancy Nicolson (far right) Tove Andersen, managing director of awards sponsor Yara UK (second left) and Guild member Rosie Carne.